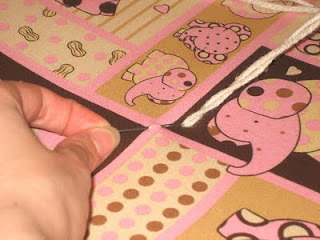 Stick your threaded needle through the quilt and back up again a very short distance away, as pictured. If you pull the yarn all the way through, and then all the way back up, you'll have a much greater risk of the yarn getting knotted up underneath. Leave a short tail (whatever length you want--3" is a good starting point) on the first side. Tie a regular overhand knot (like you're starting to tie your shoes), and then tie a second overhand knot around the first. Pull tight, arranging the knot so it is just barely above the first knot, and so holds the yarn poking up. 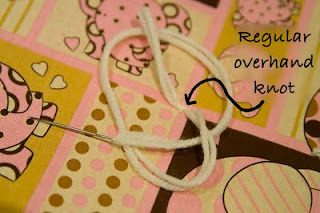 Cut the yarn to your desired length. How far apart your knots can be depends on your batting, so read on the packaging. 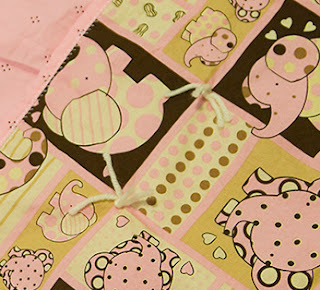 It should tell you the maximum quilting distance; remember that you can tie the knots closer together if you want. I like to arrange the knots so that they complement the pattern of the fabric.